Background: Lipid-lowering therapy and control of cardiovascular risk factors are the current recommendations of atherosclerotic disease management. Despite optimal treatment the rate of acute coronary syndrome events remains high. Inflammation plays an essential role in the pathophysiology of atherosclerotic plaque formation, progression and rupture, which conclusively causes acute clinical episodes. 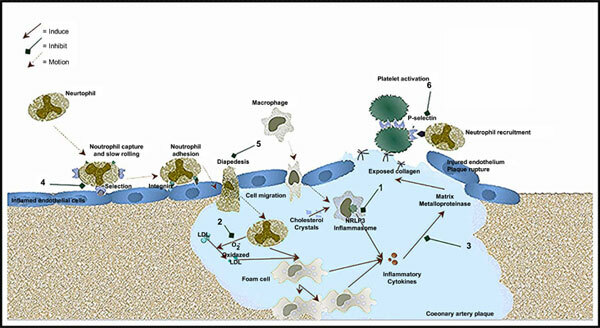 Objective: This review aims to give a conceptual description of the potential therapeutic benefits and effects of colchicine in inflammation-mediated atherosclerotic disease and hypertriglyceridemia. Method: A complete literature survey was performed using the PubMed database search to collect available information regarding colchicine, atherosclerosis, and hypertriglyceridemia. Results: A total of 42 studies met the selection criteria for inclusion in the review. Inflammation is a well-known key mediator of atherogenesis in coronary artery disease. Colchicine has direct antiinflammatory effects by inhibiting critical inflammatory signaling networks as the inflammasome, pro-inflammatory cytokines, and expression of adhesion molecules, preventing both local chemoattraction of inflammatory cells such as neutrophils and systemic inflammation including the decrease of the release of IL-1β by the neutrophils. Conclusion: Colchicine reduces the levels of inflammatory markers, stabilizes the coronary plaque, leads to more favorable cardiac healing after damage, and reduces the acute coronary syndromes event recurrence. Colchicine reduces the myocardial infarct size, myocardial fibrosis, and improves the hemodynamic parameters. Several studies report the potential attenuating role of colchicine on triglyceride levels. Current evidence though regarding the pathophysiological mechanism of colchicine’s triglyceride-lowering effect remains scarce. Keywords: Atherosclerosis, colchicine, coronary, inflammation, myocardial infarction, triglyceride. Keywords:Atherosclerosis, colchicine, coronary, inflammation, myocardial infarction, triglyceride. Abstract:Background: Lipid-lowering therapy and control of cardiovascular risk factors are the current recommendations of atherosclerotic disease management. Despite optimal treatment the rate of acute coronary syndrome events remains high. Inflammation plays an essential role in the pathophysiology of atherosclerotic plaque formation, progression and rupture, which conclusively causes acute clinical episodes.